This week, the European Tour stops in Morocco for the Trophee Hassan II at Royal Golf Dar Es Salam in Rabat. The Robert Trent Jones course is a classic layout, with cork-tree-lined fairways, long rectangular tee boxes, strategic fairway bunkers and tough greens complexes. It is beautiful, and I am grateful that I had the chance to visit Morocco and play Royal Golf Dar Es Salam in 2016 as a guest of the Moroccan National Tourist Office. In all, I spent most of a week in Morocco and discovered a country that exceeded my expectations and shattered my pre-conceived notions. Morocco is beautiful, friendly and cultured. 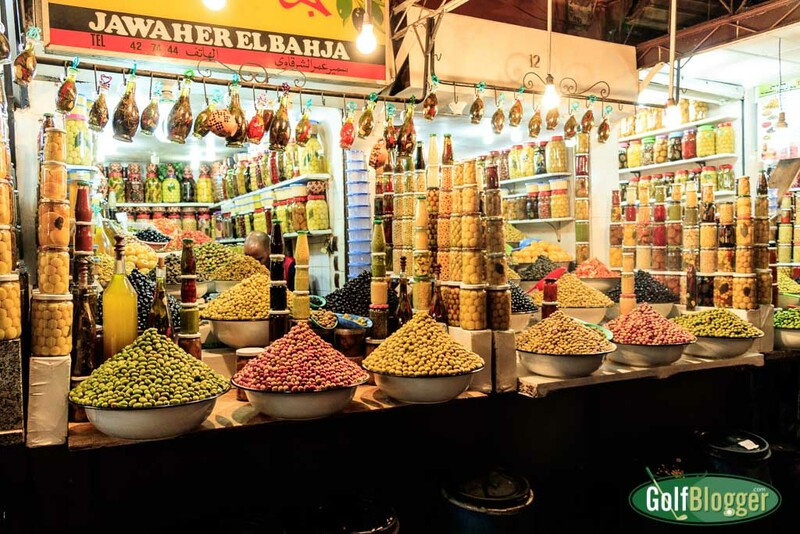 If you’re on a golf trip to Morocco, you are selling yourself short if fail to visit some of the sights in Rabat, Marrakech, Casablanca and the country’s other legendary locales. 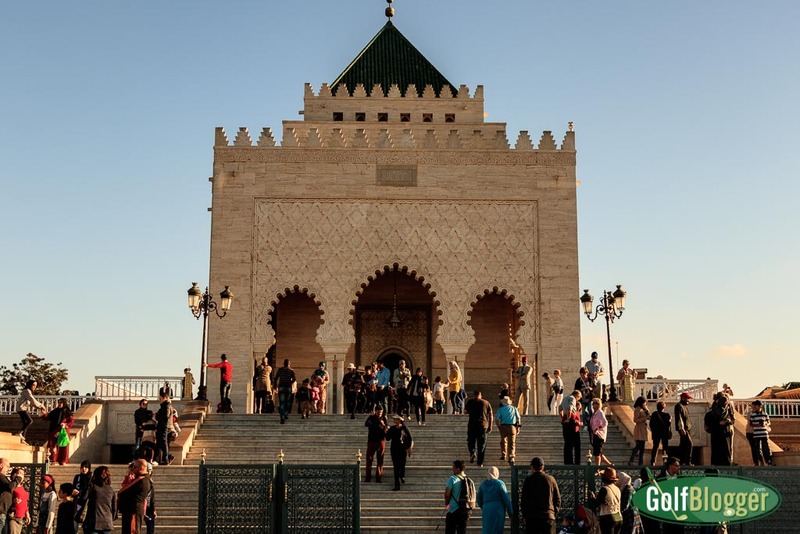 In Rabat, start with the Mausoleum of Mohammed V. One of the most important shrines in Morocco, it is the final resting place of Mohammed V and his sons Hassan II and Prince Abdallah. 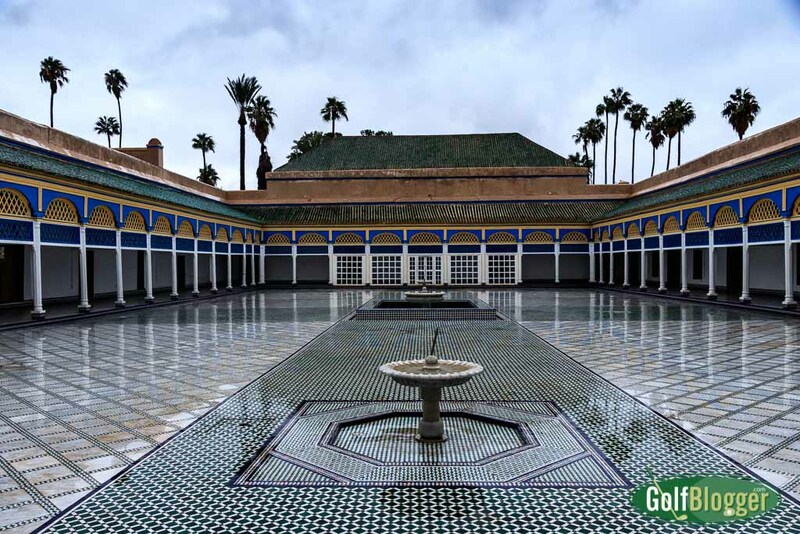 Read more about the Mausoleum of Mohammed V in Rabat here. 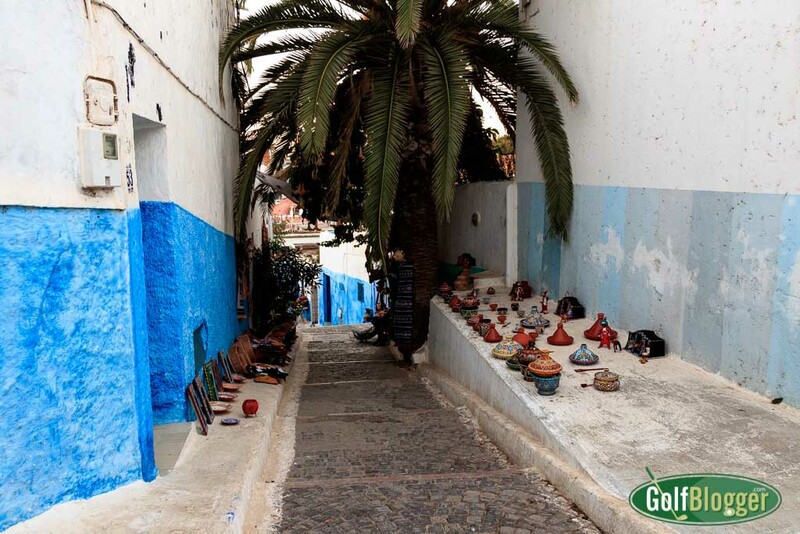 Then, head over to Old Town Rabat, the fortress of the Kasbah des Oudaias, an exotic maze of narrow, blue-walled streets. Visit the Andalusian gardens, and stop for a snack in a restaurant overlooking the Bou Regreg River. Read more about Old Town Rabat here. Finally, go shopping in the Medina in Rabat. During my time in Rabat, I stayed at the amazing Villa Mandarine. I wish I could go back and just spend a week there relaxing. After playing in Rabat, head to the luxury resort, Mazagan. On the shores of the Atlantic, you’ll find a different type of golf in Morocco than the cork lined fairways in Rabat. Mazagan has a Gary Player designed seaside golf links that accompanies a massive casino resort complex. After golf, hang out at the pool, get a massage and then eat in one of the hotel’s many restaurants. The resort is as modern as any you will find. In opulence, it exceeded pretty much every hotel I have ever visited. Three hours drive further down the road is Marrakech. Anyone remember the Crosby, Stills and Nash song? A view of the fourth green at Royal Palm Golf in the shadow of the Atlas Mountains. Golf in Morocco is a growing interest in Marrakech, which is the home of some twenty golf courses. Not to be missed is Royal Palm at the Fairmont Royal Palm Marrakech Golf & Country Club. Royal Palm is exactly what you would want in a resort course: interesting, without beating you up; value for shot-making, but not overly penal for mistakes. It was a much fun as I have ever had on a golf course. Another great course is Amelkis, designed by Cabell Robinson in 1995. The layout is more of a desert experience than Royal Palm, with islands of green set amidst sandy waste. Unfortunately, my group only got to play half the course. Dark skies led to serious thunderstorms which drove everyone to the shelter of the very nice clubhouse. A view from an adjacent building of the souk at Jemaa el-Fnaa. 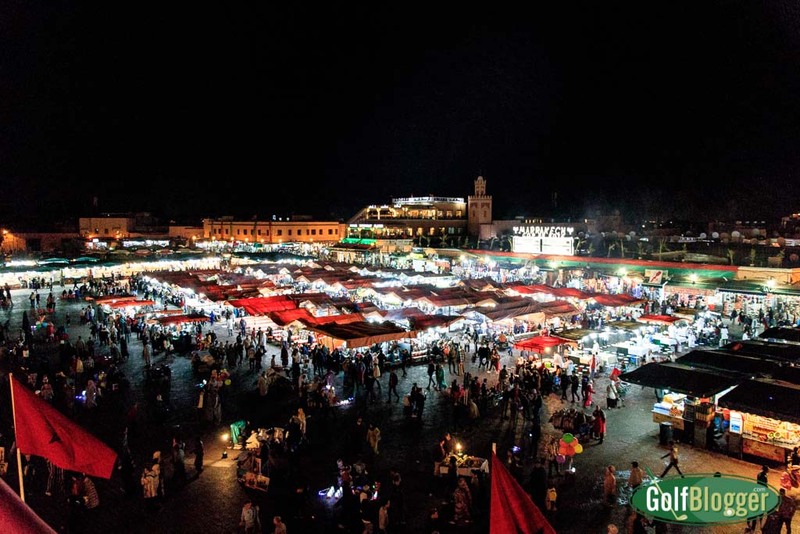 Golf aside, no trip to Marrakech is complete without stopping at the internationally famous Medina and the souk at Jemaa el-Fnaa. It is a vast eating, shopping and entertainment district that is something out of an Arabian Nights fantasy. The photo above was taken from a balcony overlooking the main square. Within the boundaries of the Medina, I think you could find anything your heart desires. Also not to be missed is the Bab Agnaou, one of nineteen gates in Marrakech dating to the 12th century. Behind the gate lies a kasbah — a shopping district. Marrakech’s Bahia Palace, built in the 19th century is a masterpiece of Moroccan architecture. The palace and its grounds stretch out over some 20 acres. The Bahia Palace and adjacent garden grounds has been used for scenes in many movies, including the Jewel of the Nile, The Man Who Would Be King, Brideshead Revisited and Alexander. And then there’s the food. I love Moroccan cuisine. 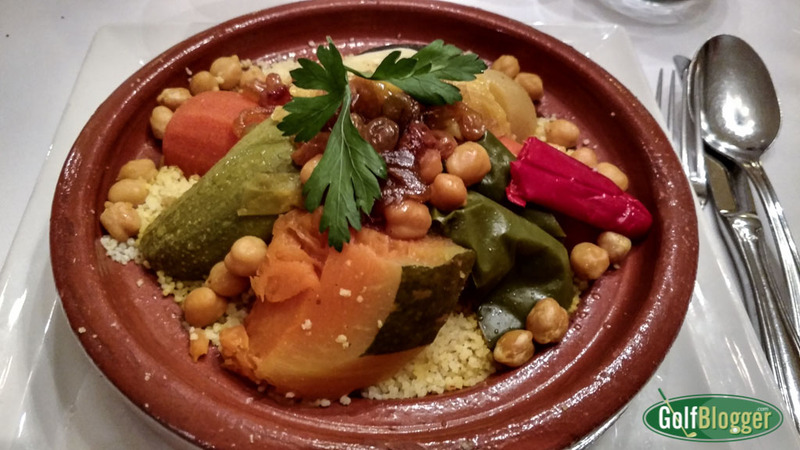 Skip the touristy Americanized fare and try tangine, couscous, pastilla, Harira and taktouka. The flavor profile is unique, with garlic, cumin, ginger, paprika, saffron, tumeric, allspice, and plenty of lemon and olive. Their seafood dishes are amazing. Plan a trip to play golf in Morocco. And give yourself plenty of time to take in the culture and history. It will be the experience of a lifetime. For my part, I hope to someday be able to return, and this time, to take Mrs. GolfBlogger. There is much more I would like to see in places like Casablanca, Fez and Tangier.